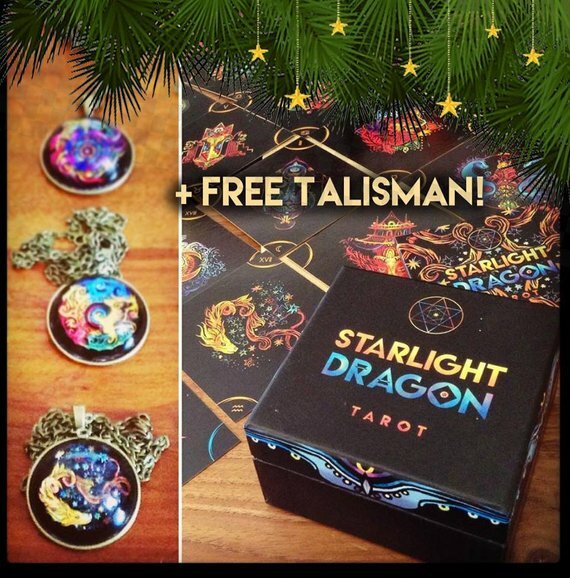 Our Starlight Dragon Special for Xmas/Yule – buy a deck or the bundle of deck and book and get one of our pieces of Starlight Dragon jewelry for free (value 19$). Stay tuned for additional seasonal specials! Thank you, Sissy, and continue to enjoy the deck! Last post about a wonderful tarot deck I discovered recently. 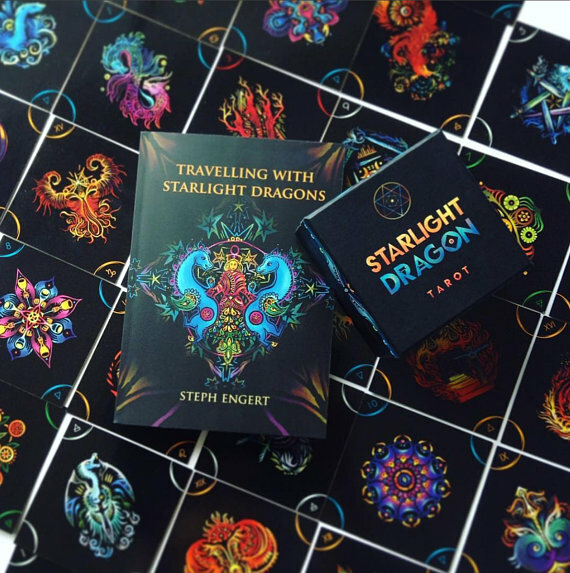 The Starlight Dragon Tarot themed on dragons. This is an unusual albeit fascinating tarot deck. Dragons are magnificent creatures: powerful, wise, challenging, they belong in the dream realms and in myths and are more associated with magic powers than any other creature. They are among the oldest myth creatures found in all mythologies; represented as wise and respected divinities in the Eastern myths, dragons were rather feared in the Occident. But they have always been associated with superior knowledge, not accessible to humans. 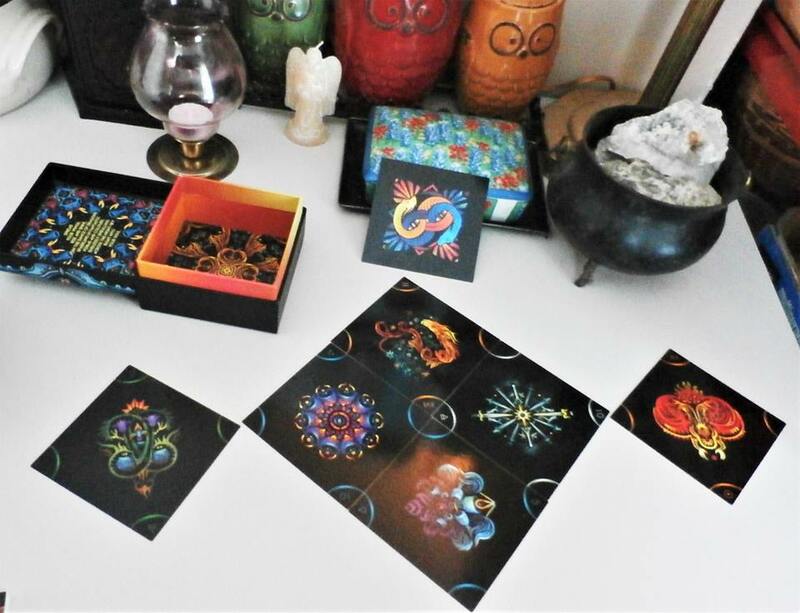 Conceived by Steph Engert, who has studied for a long while all mythic and symbolic meanings of dragons and marvelously illustrated by wonderful Nora Huszka, this unique deck combine the diversity and the universal presence of dragons in various myths from throughout the world. Images of dragons are shaped to suit the card meaning, respecting the symbolism of the cards, the colors associated with the cards, but also the astrological element, the association with numbers and even the Kabbalistic symbols that correspond to each card. The power of the dragon can thus lead in any field one chooses to work – dreams, creativity, fantasy, occult or introspection. I loved the imaginative and original way the book introduces and initiates you to the tarot- by stimulating imagination, like a beautiful fantasy story. 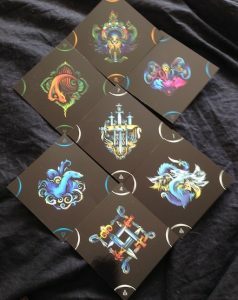 I also loved the tarot- I think that it is beautiful and inspiring and really easy to use, even if you are not familiar with it. 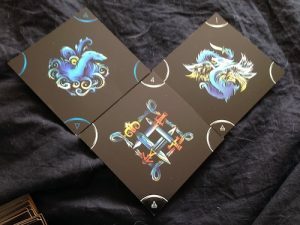 The unique beauty and originality of this amazing deck is that it allows you to find your own preferred way to use the cards- by developing your creativity, self-exploration, or whatever else could empower your own magic. The experience of reading this tarot is quite akin to fly mounted on a dragon. It will take you to new, fascinating and enchanting worlds of knowledge, self-understanding, and inspiration the existence of which you had never before suspected. 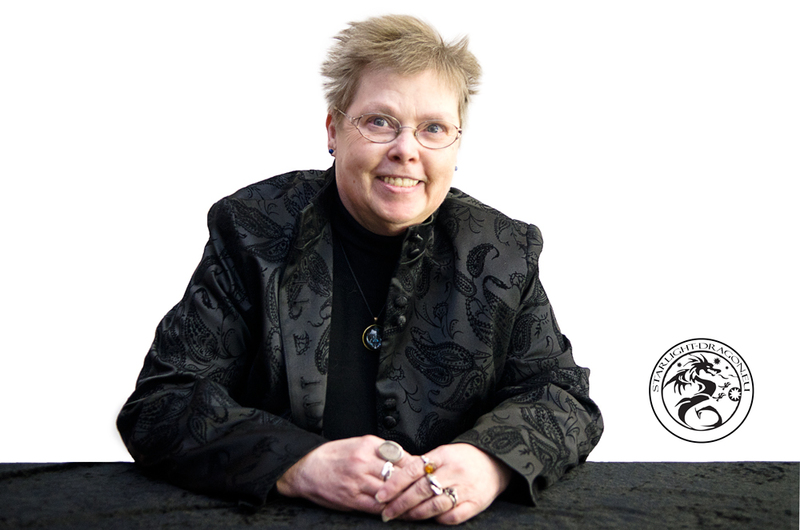 World Tarotday is observed every year by tarot lovers and experts world-wide since 2003 to celebrate Tarot in its wide and still evolving diversity. 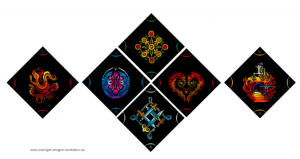 Our worldwide Tarosophy Tarot Association provides this year a map to light up tarot everywhere, please visit on the 25th May http://www.worldtarotday.com/ for the map and offerings. For the Tree I selected the Three of Coins, the three of the growth in early summer, while the light hours are still growing. Gazing on the card and breathing evenly in and out I begin to mirror the card inside me and step by step I turn into a tree, I feel my roots growing down into the ground below and my head transforms into the mighty crown on this old tree full of force from the juices it pumps up from below. From my shoulders to my belly, I am aware of the strong branches full of satured leaves swaying in the wind, enjoying the sunlight. When I have fully formed as the tree, I turn again to my roots and the juices the earth provides. I lay out 2 cards to see from what I am nourishing my growth at this time. I get the Tower and the 8 Wands and learn from this, I have to find new ways, a turnabout underground to find new nourishing resources and they assure me fast, directed growth. I image new lights flickering in my roots and draw up new juices up to my crown. Then I lay the card for my crown, which shows my aim: I The Magician, new skills, success and I draw two cards sideways on what I have to do to manifest my growth and my success: The Princess (or Page) of Coins on the left and the 7 Coins on my right. The resources need to be adapted/reorganised (the 7) for a new start (the Princess). As always with these ‘limitless cards’ you can add more cards to get more detailed information. I close down my exercise by projecting my tree form back onto the 3 of Coins and feeling myself returning into my present person form. 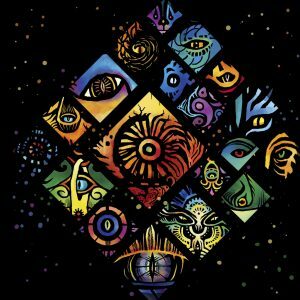 The Sun in Taurus – what does our Hierophant say? After the fiery start into the astrological new year with Aries and the corresponding Emperor in our tarot cards, we are now under the influence of Taurus and the Hierophant in the tarot. Taurus is about enjoying life in a sensual and earthy manner, building stability and being reliable. 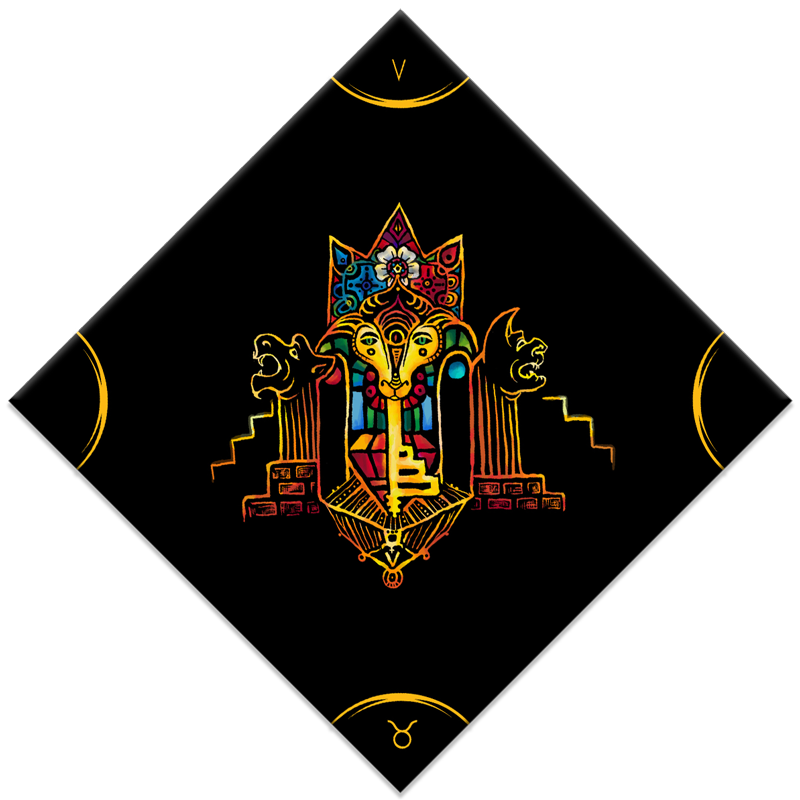 The Hierophant links this to the all-important activities of teaching and learning. 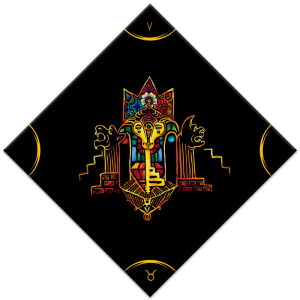 As we enter the temple, the Hierophant, a tall elephantine dragon, is seated under a stained glass window of a white rose. He is holding an enormous key. The pearl of wisdom shines from his third eye. Welcome to the temple of teaching and learning, welcome to me, its warden, the dragon says in a voice, reverberating like a deep gong within us. Here is the manifest home of the knowledge and wisdom dragons have imparted to human beings from time immemorial. You have met already the Magician and the High Priestess. 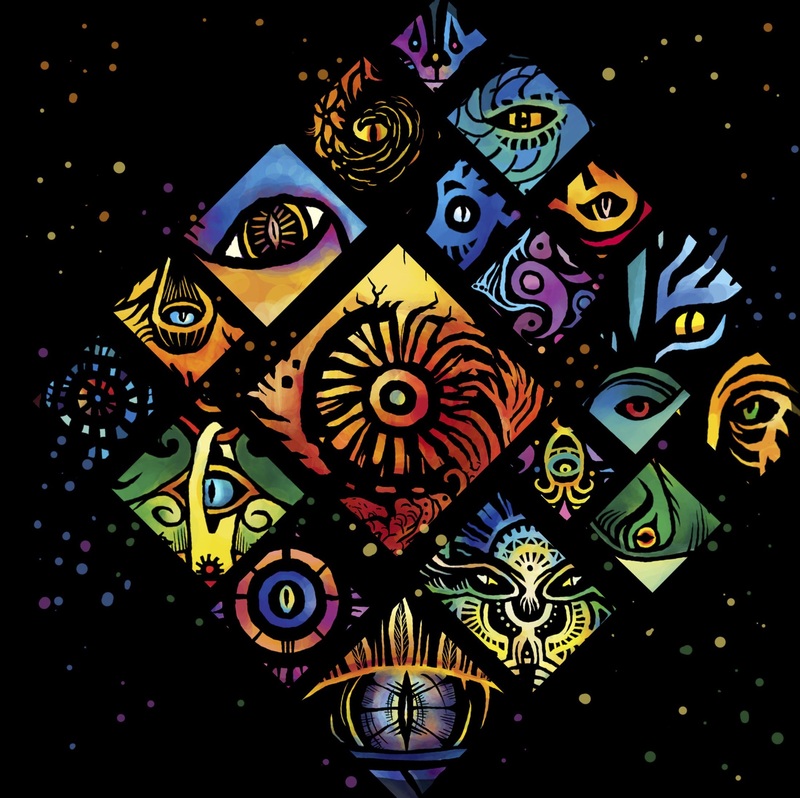 Together we are your wise dragon-teachers appearing in the first third of your Fool‘s – journey, while you grow up and learn. Each of us is teaching you in a different way, as you very well recognised already with the Magician and the Priestess. I am the transmitter and translator of hidden knowledge into openly available teachings. I am the keeper of the traditions and their inner sense. I open the doors to those willing and ready to put themselves to learning, and I guide them along to the treasures, which I guard under my key. I am the one teaching and counselling Emperors and other seekers alike in all kinds of practical applications of high teachings. I also hold the invisible key to greater mysteries – the path of the rose and the thorn. This path has to be walked with a pure heart and pure intent – hence the rose is white. Apart from the Five, the number of spiritual endeavour beyond the four earthly elements, you see the Two and the Three making it up. The Two, the number of polarity is expressed in the colours red and blue in the stained glass window. and in the small red rose mirroring the white one, on the bottom of my treasure chest – the rose of love, of passionate dedication to knowledge. The Three is also in the win- dow as well in the bit of the key. This refers to the tripartite world in the oldest cosmologies of the world and the many triplicities in belief systems and symbols. Outside, three steps are visible from each of the two sets of stairs up to the temple, guarded by two dragons. He comes closer to us. You see, my dragon form visible to you has features of an elephant. The elephant has esoteric similarities with the bull – and Taurus is my sign: the wisdom and responsibility for the herd, those who are ent- rusted to me. I have a very long memory. I also share properties with the Hindu elephant god Ganesha – a deity of learning and wisdom as well as success. There is an even deeper lesson in this connection – the one of sacrifice, which we touched upon, when I pointed you to the red rose. One of the legends about Ganesha shows us the importance of being devo- ted to knowledge and learning up to the point, where we are ready and willing to sacrifice our comforts: As Brahma‘s scribe, Ganesha one day missed his pen, when Brahma began to dictate a part of the Mahabharata. To be able to write, Ganesha removed one of his tusks and used it as a pen. This is why he is often depicted with a broken tusk. We look into his friendly encouraging eyes and feel drawn to him. We intuit his silent plea, that we be open and dedicated to his teaching. But do dragons really care so much? … And then our time today with the Hierophant is over. We know we have to come back here often. You may also be interested in a video about this card, Nora Huszka and I did a year ago on YouTube. 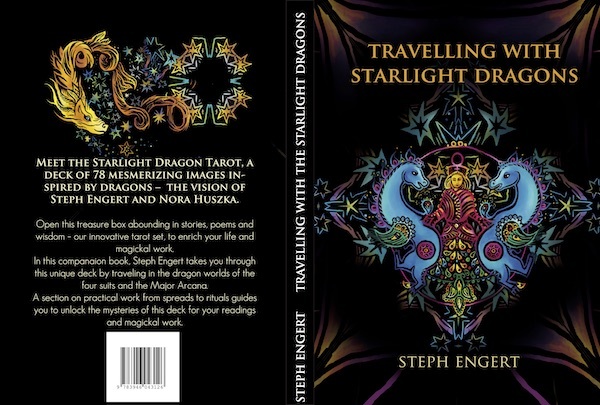 Travelling with Starlight Dragons – the Book! 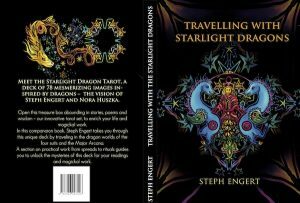 The long-awaited companion book on the Starlight Dragon Tarotdeck is published. On each order of the Starlight Dragon deck throughout the whole of November, we will add one of our talismans as our gift to you! 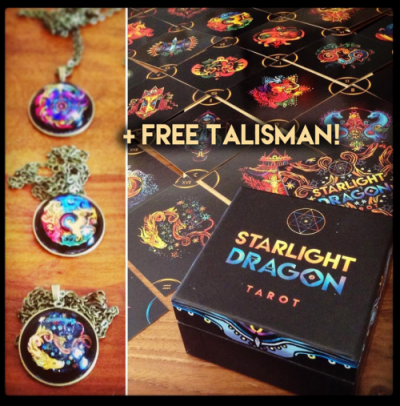 Which dragon taliman will come to you? 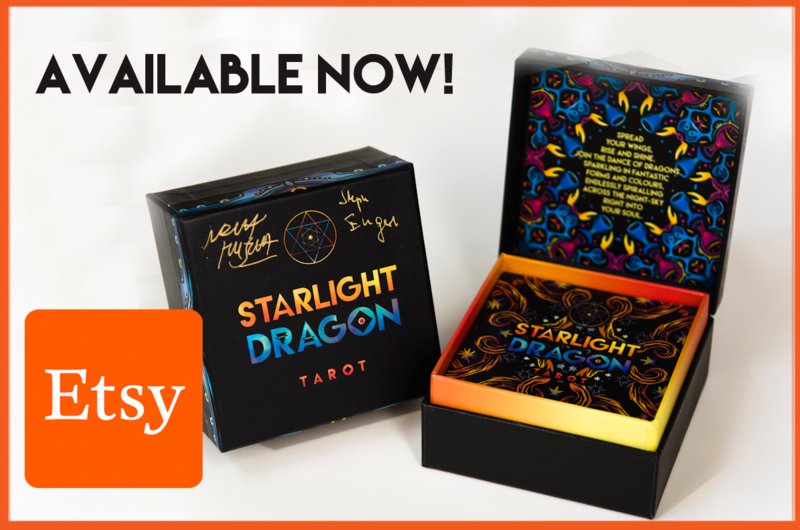 Allow yourself to be surprised – then have your Starlight Dragon always with you! Reward yourself or treat you tarot- and/or dragon-friend to thus unique present. The Dragon eye is a symbol of dragon power. The very word dragon, in the original Greek drakon, was derived from a root meaning ‘see clearly’. For the powers of their sight, dragons were often engaged as guardians, for example the 100-headed Ladon, protecting the golden apples in the garden of the Hesperides for the goddess Hera. The eyes of dragons were also considered as very dangerous, their glance often lethal. Those going out to confront a dragon usually were warned to avoid looking the dragon in the eyes, so as not to be turned into stone are be killed on the spot. We see in the Greek root ‘to see clearly’ more of a reference (and reverence) to the dragon’s superiority in seeing things in a much wider perspective than we, due to their great wisdom, gained in their long lives, but also due to their detachment from human affairs. – the eyes are an al pervading symbol throughout the deck; this applies especially to the pip cards, many of which show no dragon figures. But do pay attention and you will see dragon eyes lurking, gazing at you, assessing you in practically all of the cards. See above a collage of some of these eyes, which we use in our presentations of the deck. 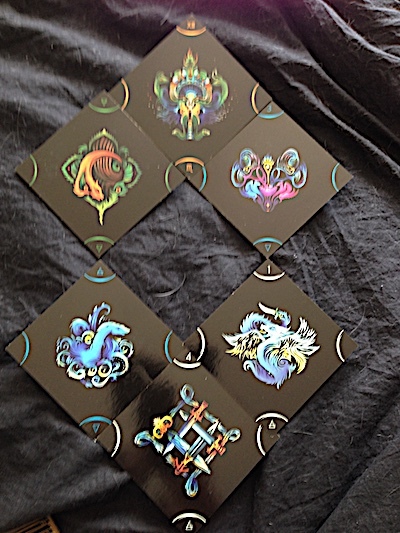 But we also included in the deck an extra card “The Eye” (see above) as a Major without number. This card can be used if different ways: if it comes out in a reading it is a very strong hint that you need “to see clearly” n the matter you are enquiring about. This means, to look beyond your immediate concerns and from a position of detachment, the long view, a circumspect view. Ask yourself what you refused to see so far. 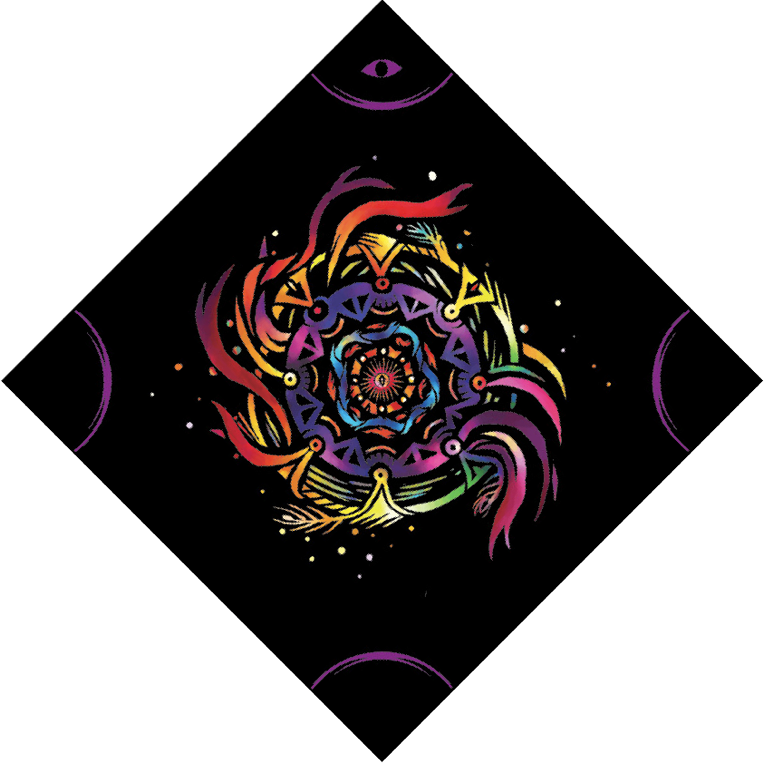 In readings and other practices of self-exploration you might also take out this card as a witness and guide to your interpretation of your cards. The Solar Eclipse is also about seeing. Because the sun is eclipsed we see things in the shadow, which are usually invisible or in the background because we see what is in the sunshine. I will use this time tomorrow to see clearly with the help of the Starlight Dragons that which is hidden by the bright sun-light and which I need to perceive and to act upon in order to advance. I will take out the “Eye” card and immerse myself into it. Then I will draw as many cards from the shuffled deck as I feel I need and will lay them out face down under the Eye, having considered my concern while shuffling and paying the cards. I will do this well before the time of the eclipse and leave all the cards. 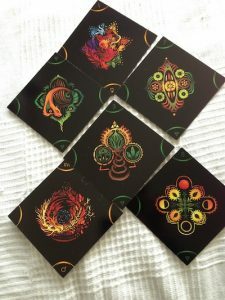 At the time of the eclipse, I will return to my cards and my concern and while keeping in my mind I will touch the Eye card lightly and allow it to move and select up to 3 cards. These three cards will have the message for me.